Cardiac ultrasound is also recognized as echocardiography. Cardiology ultrasound systems are involved with the ultrasound imaging of a fast moving complex heart positioned deep inside the body. Valves and blood flow analysis use various ultrasound Doppler approaches that are the most common tools. Cardiology ultrasound systems have become extensively used in last decade as an instrument to help prevent cardiac diseases. This system also help patient to find their problems in early stages for treatment of cardiovascular diseases. With increasing constraints such as limited space, mobility essentiality, or the scanning done on the field, raised the requirement for such portable devices and thus portable cardiology ultrasound systems were invented. At present, portable ultrasound systems can be used for cardiac, endocrinology, pediatric and radiology applications. Portable cardiology ultrasound systems are used for several stages of heart valuation. Portable cardiology ultrasound devices have been created for point-of-care assessment to extend accuracy in diagnosis of heart conditions. Further, increase in population suffering from cardiac disorders resulted in the innovative introduction of portable cardiology ultrasound systems. 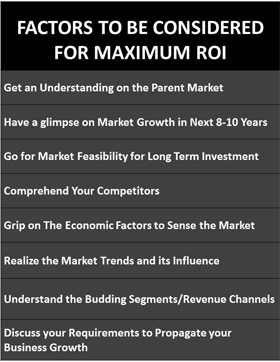 Portable cardiology ultrasound systems market is anticipated to record a significant CAGR over the forecast period i.e. 2018-2027. Many multi-national companies are concentrating towards new product advances in portable cardiology ultrasound systems. 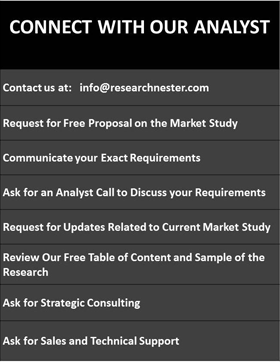 Moreover, the increasing prevalence of cardiac disorders is expected to drive the market rapidly across the globe. At present, technological superiority and advantages of echocardiography over invasive cardiac diagnostic procedures are the major drivers for the growth of global portable cardiology ultrasound systems market. Furthermore, the highest numbers of deaths are caused due to cardiac disorders across the globe which is increasing awareness amongst the population for various preventive measures, which is estimated to propel the market growth additionally. 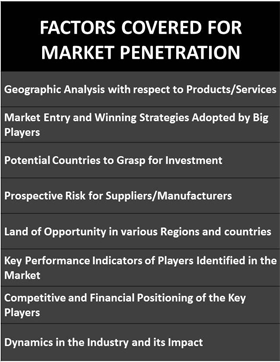 On the basis of regional platform, global portable cardiology ultrasound systems market is segmented into five major regions including North America, Europe, Asia Pacific, Latin America and Middle East & Africa region. 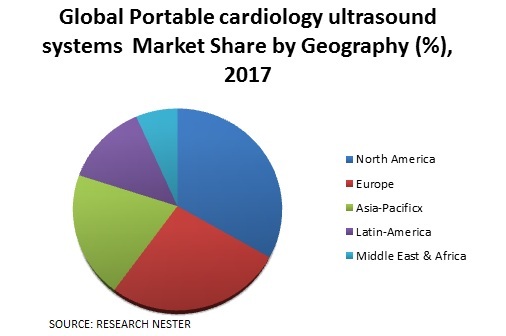 North America is estimated to be the highest revenue generating region in portable cardiology ultrasound systems market owing to increasing market penetration of therapeutic ultrasound, growing emphasis on minimally invasive procedures and the presence of sophisticated healthcare infrastructure. North-America is trailed by Europe in portable cardiology ultrasound market. Rising geriatric population with rise in cardiovascular diseases globally are major driving factors for portable cardiology ultra sound systems market growth. The advancement in computer software allows for reducing the number of steps needed, thereby helps shorten the exam time. Also, by improved imaging in a smaller package, the global market of portable cardiology ultrasound systems is expected to be driven further. 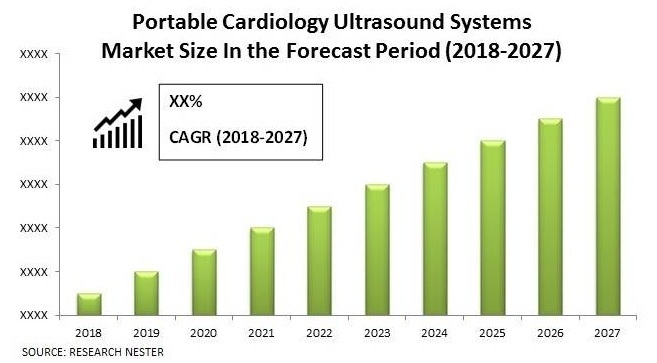 Easy transportation and requirement of less space can also be key factors which will increase the demand of portable cardiology ultra sound systems market. Professionals adopting portable cardiology ultrasound system for diagnosis can also drive the global portable cardiology systems market. Furthermore, requirement for scanning on the field in various situations and on-point care assessment will additionally increase the global portable cardiology ultrasound systems market growth. However, cost constraints associated with portable cardiology ultrasound system and less availability of trained and experienced operators can restrain the market of portable cardiology ultrasound systems across the globe.